SEA LIFE Melbourne, located on the Yarra waterfront opposite the Crown Casino, is one of Victoria's leading visitor attractions and a great outing for the whole family. Plan your visit ahead by checking the official site visitor info here. No trip to Melbourne is complete without visiting SEA LIFE Melbourne. Situated on the riverside, just opposite the Crown Casino, SEA LIFE Melbourne is home to thousands of animals, including sharks, turtles, stingrays, sawfish, tropical fish and much, much more. As one of Victoria's leading family and tourist attractions, Melbourne Aquarium offers entertainment for young and old alike. Walk underwater through the glass viewing tunnels and see Australia's marine life like never before! Come within inches of huge sharks, rays and turtles and see some of the remarkable marine and freshwater animals that Australia is famous for. To find out more about the habitat worlds at Melbourne Aquarium, head to the Explore section. 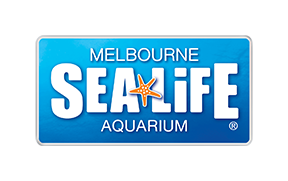 Book your tickets in advance here on the official SEA LIFE Melbourne website and save up to 20%, compared to standard 'on the day' prices! Whether you're a local looking for family activities in Melbourne, or if you're just visiting Victoria on holiday, Melbourne Aquarium is a must-see visitor attraction.